You might find it easier to coordinate colors if you choose your papers first. I usually choose the patterned paper first, then add the cardstock. Even though we are copying existing kits and color schemes, since papers come in such a wide array of shades, it's easier to choose these first, then match embellishments to them. If there are contents in the original kit that you KNOW are not your style and you won't use them...don't worry about creating/copying them. I know this sounds obvious... but when the kits are so pretty, sometimes it's easy to get side tracked and try to match EVERYTHING, even things you won't ever use! If you have certain "go to" supplies that you use on most pages...add them to your kit! Another thing that sounds obvious...but might be overlooked when counterfeiting another kit. For example, if you use ribbons and alphabet stickers on every page...add some extras to your kit, even if the inspiration kit doesn't have any. Go through the inspiration kit each month and decide which items you might not have in your supply stash, but might be able to "hand make". We will help you with this step...as we will provide links to tutorials for making embellishments throughout the month. If you are going "no buy" or have a small budget for scrapbooking supplies, give yourself a "counterfeit kit" budget for absolute necessities up front. Maybe you decide that the MAXIMUM amount you will be able to spend for odds and ends to complete your counterfeit kit is $5, or maybe it's NOTHING at all!!! Whatever the case, make a budget and stick to it...this is what makes the challenge fun!!! If the inspiration kit is simply not your style… don't counterfeit it exactly, or you'll never use it!!! You can still play along with the month's challenges...instead try some other ideas, think outside of the box. Use the list of "kit contents" as inspiration, and recreate your own kit with the same types of supplies, but in a different color or style that corresponds better with your preferences/photographs/scrapbook style/tastes. Make a "page kit" rather than a large kit..."counterfeiting" just a few items from this kit as inspiration. Using the color scheme from the original kit as inspiration, try to re-create a kit of your own using whatever supplies you have available. Remember that there are no rules round here, the Scrapbook Police won't be knocking on your door if you go rogue and everyone is free to counterfeit their own kits in their own way. The ONLY "rule" we have in fact, is to have FUN! Enjoy shopping your own supplies that you bought because you love them and get them used up and into your own scrapbook albums where you can love them even more! The tips and tricks are helpful, thanks! Although the videos are nice, what I am really looking for is how to create my own kit based off of a photo of another, which is what we're supposed to be doing every month - right? Are there any videos or even side-by-side photos of how to do that, or people's various takes on putting together kits? 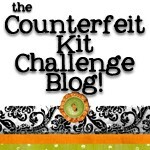 Although I don't think any of us (the DT) have ever done a step by step photo set or blog post about the exact details of putting our counterfeit kits together (note to self: do this next month? ), we often do explain our process in more or less detail at the beginning of every month when we present our counterfeited kits. We all approach this slightly differently so it might be interesting for you to go through all the kit reveal blog hop posts one month to see what each of us does.